Digital signage is an advertising technology that uses specialised software to display information and marketing messages on LCD, LED and projection screens. Examples of content that can be displayed include static promotional images, menus, video, weather forecasts and interactive content. At Discount Displays we aim to make buying and installing a digital signage solution simple and cost-effective. 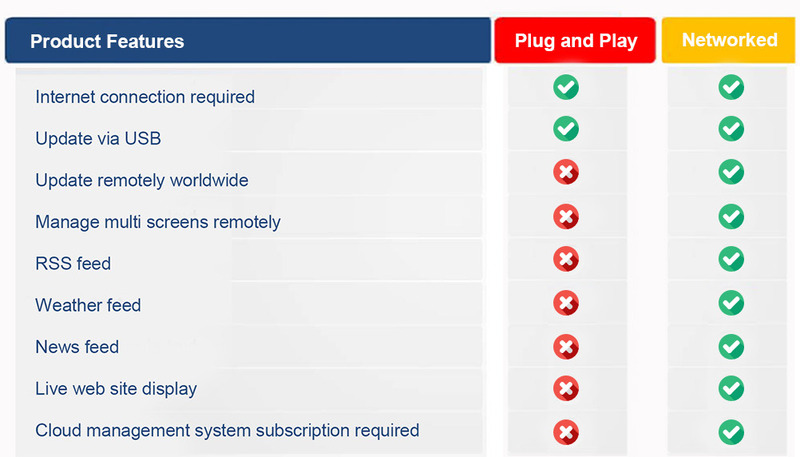 From simple, entry-level plug and play systems to full network displays, which can display live feeds and be updated anywhere in the world using top-tier software. We have a wide range of digital signage solutions from wall-mounted menu boards to free-standing interactive displays. We offer a live demonstration service at our office in Croydon so you can see first hand the instant impact digital signage can have on your business. Call us on 0844 800 1020 to book your demo appointment and for more information on our range of digital signboards. Typically network solutions require you to invest in additional networking hardware - complicating the installation process and the overall system. Hardware and software usually come from different sources which can result in confusion and conflict when identifying any potential faults. In contrast to this, any issues with our screens or digital signage software will be dealt with directly by us; one supplier, one solution. Connect your Network Screens to the internet wirelessly via Wi-Fi or via a Local Area Connection. If an internet connection is not available a 3G router can be incorporated into the screen, meaning that we can provide an integrated network solution for any location. The Android Advertising Displays come with a built-in HD media player, allowing you to update them using a USB memory stick. Load your pictures and videos onto a USB memory stick then insert it into the display, which will copy the files into its internal flash memory. Once you remove the memory stick the screen will then start playing the pictures and videos in a continuous loop. For more advanced use the Android advertising displays come with a piece of free scheduling software for displaying different content at different times of the day as well as setting image display duration and transition effects. For example, a restaurant can create three daily schedules; the breakfast menu in the morning, a lunch menu in the afternoon and the dinner menu in the evening. If you prefer to keep it simple you can update the screen directly without using the software. For a small charge you can also upgrade your screen to be networked, allowing you to remotely update your screen via LAN, Wi-Fi or 3G. Take advantage of our scalable Queen’s award-winning solution by upgrading your standalone display to a network solution without the need for any additional hardware.